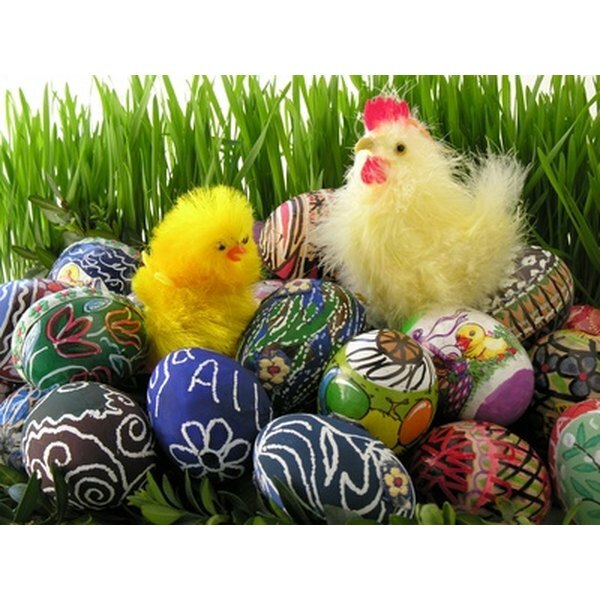 Some pagan customs have been incorporated into the Christian Easter celebration. Pagans had a spring festival that celebrated the ancient Anglo-Saxon/Germanic fertility goddess Eastre or Eostra, which included customs involving eggs and rabbits. The English word for Easter derives from that goddess. The Christian holiday, which celebrates the resurrection of Christ, incorporates many of the customs practiced in ancient pagan traditions. The Anglo-Saxons and other Teutonic tribes were not the only ones to celebrate the rites of spring. A pagan goddess of fertility and spring was honored in many cultures; for example, to the ancient Assyrians and Babylonians she was known as Ishtar and to Semitic tribes as Astarte. Traditionally, eggs represent fertility, life and birth. One of the Teutonic legends, which were first written down in the 1500s, describes how a small girl found a wounded bird and prayed to Eostra. The goddess appeared, crossing a rainbow bridge. She turned the bird into a rabbit and told the girl that, from then on, the rabbit would come back once a year with rainbow-colored eggs. In an attempt to convert pagans to Christianity, the Church placed Christ's resurrection at the time of the celebration of Easter. Since the themes of rebirth were similar, the Church incorporated some of the facets of the pagan Easter into the celebration of Christ’s resurrection. Doing so was supposed to ease pagans into Christianity, while giving it more appeal. Many Christians debate whether or not to continue practicing the pagan aspects of Easter, such as any customs regarding eggs and rabbits, both of which symbolize fertility and producing offspring and have no connection to the resurrection of Christ. There are several connections between the Easter bunny and the goddess of fertility. The first connection is fertility itself. According to Ace Collins, author of “Stories Behind the Traditions and Songs of Easter,” “For thousands of years rabbits have been considered to have mystical powers. Many cultures that built statues of fertility gods and goddesses gave them rabbit heads.” MSNBC points out that, in the 1700s, when Germanic immigrants came to Pennsylvania, they brought stories and customs about the "Oschter Haws," as they called the rabbit, with them. Children built "nests" out of hats or bonnets and placed them in the yard or barn. On Easter morning, they would find the hats filled with colored eggs. The children then decorated the hats. What Are the Family Ties for the Greek Goddess Aphrodite? What Are Bowlers, Bonnets, Beanies & Berets?